There are classics, and then there are modern classics. 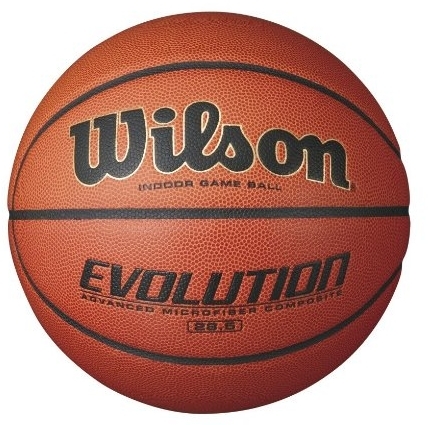 Evolution series basketballs definitely deserve to be in the conversation for the modern classics category. Wilson is already an established name in sporting apparel and the overall quality of their products should never be questioned, but basketball is not their traditional market so we took a closer look at this model. Evolution series is designed for professional use and it comes in 3 standard sizes. We tested sizes 6 and 7 and the results were overwhelmingly positive. We broke the test down in a couple of categories. Our first encounter with Evolution series was a bit surprising. For a model in this price range, the attention to details and the quality of the design is really impressive. You can use these basketballs straight out of the box and have them in the NCAA final four tournament. There are 3 available sizes: size 7 (29.5”), size 6 (29.5”) and size 5 (27.5”), so the ball is available to all kinds of players. The technology used in the making of the Evolution series has a clear focus on the grip. Micro-pebble technology makes sure that the ball has the optimal contact surface and lies comfortably in your palm. Both sizes tested showed top levels of control and handling felt natural. We got used to them within a first couple of minutes and had no issues at all. The wet-hand test showed amazing results and we then noticed that moisture-wicking laid-in channels are a bit deeper. This feature makes handling effectively even when there is increased moisture on the hands. The importance of the consistency cannot be understated, especially with professional indoor basketballs. Bounce and consistency tests were within the industry standards and there were almost no deviations in the results. Evolution series uses a Cushion Core technology. We used ball throwing machines and tested the bounce and accuracy rates and the results were close to being perfect. There was no deflation at all, even when the strength of the bounces was pushed way above the normal. Wilson Evolution series basketballs did really well in our tests, and we can definitely confirm that overall user rating of 4.6 stars is well deserved. The quality is undeniable and in this price range, there is hardly a better choice. Compared to the competition, Wilson did a good job of striking a perfect balance of price and quality. Evolution series is primarily intended for personal use, but many of the camps and even tournaments reported using these balls for the competition and were quite satisfied with the performance. Wilson is also offering black color edition. We can agree with most of the customers and indefinitely recommend Evolution series to anyone looking to buy an affordable semi-professional basketball. This is our number one pick for indoor use.